The Harp Concerto by Reinhold Glière is a production of its composer’s old age. Of Belgian descent, but born in Kiev, Ukraine, Glière was a close co-eval of Rachmaninov, and became a pupil of Arensky, Taneyev and Ippolitov-Ivanov at the Moscow Conservatoire. He later taught in Moscow and Kiev, researched Azerbaijan, Uzbek and Ukrainian folksong and finally settled in Moscow in 1920. His early works show the colourful Russian cosmopolitan style, imbued with the accents of Russian folk music but treated with considerable orchestral sophistication, that he had learned from his teachers, and he did not modify his idiom much throughout his long life—certainly not with the transition of Tsarist Russia to the Communist USSR. While keeping himself out of the political limelight, Glière managed to prosper under the new regime, for whom his brand of colourful nationalism, romantic aspiration and classical form was pretty well the officially-approved idiom. Glière is best known for such vivid orchestral scores as his massive Third Symphony (Ilya Murometz) and the colourful Soviet ballet The Red Poppy, but he wrote works in a wide variety of genres and sometimes for unusual combinations, such as his 1942 Concerto for coloratura soprano and orchestra. He composed his Harp Concerto in E flat major, op 74 in 1938 for the harpist Ksenia Erdeli (1878-1971), whom he consulted so frequently on the effectiveness and practicality of his harp writing that he eventually offered to name her as joint composer of the work—an honour she declined. 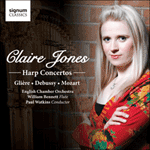 Scored for a comparatively small orchestra, the Harp Concerto could easily be performed by a chamber orchestra, which enhances its quality of charm and intimacy. The three movements are conceived on an ample scale. The first is a full-scale, rather dreamy sonata-form movement with a highly melodic second subject that has been compared with Rachmaninov for sweeping lyricism. The Anadante second movement, begun by a brooding, low-lying passage in the strings, is cast as a theme and variations, the rather plaintive theme being simply announced by the harp. There are six variations, some of them calling for considerable bravura from the soloist. The finale is a cheerful and carefree rondo, its main tune almost Mozartian in cut and rhythm, but with plentiful displays of Russian folk-colouring in the intervening episodes.